A retired risk manager for a national insurance company, Patricia had already been a docent at the Dali for many years when her eyesight began to fail, a result of diabetic retinopathy. 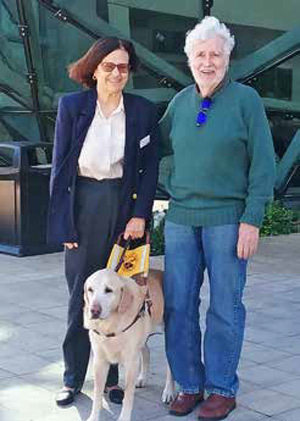 At first she resisted the idea that she might benefit from a guide dog, but after a series of small mishaps – including running into a bench that was part of a new exhibit at the Dali Museum – she decided it was time. “Getting Dave was transformative for Patricia,” says her partner Tom O’Shea. “Losing her sight was very isolating and Dave helped restore Patricia’s confidence in her ability to get around.” Dave’s now been with Patricia for over eight years and the two have become inseparable. “Dave never leaves her side, sleeping by the bed and following her from room to room in the house,” says Tom. I met Patricia, Tom, and Dave at the Dali café shortly before one of Patricia’s tours. Dave isn’t small, but he had managed to curl up on the floor in front of Patricia’s chair. When I sat down at the table, he slowly adjusted his body so his head rested on one of my feet. I was immediately smitten. As Dave was working and in his official guide dog harness, I wasn’t supposed to give him too much attention, but I definitely wanted to. Since Patricia is one of the Dali’s top docents and has been named docent of the year, it’s obvious that her tours are an outstanding experience. “I’ve had parents come up after the tour and say this was one of the best museum tours they’ve ever had. Their children were paying attention because of Dave,” says Patricia. Dave is getting up there in dog years as he’s 10 ½ and will retire next year. In retirement, he’ll get to stop working and just be a dog, maybe even take a nap on the couch or play tug of war – both of which are totally off limits for guide dogs. Patricia will get a new, younger guide dog, but Dave will stay on to live with the family. “The two dogs will meet for the first time in a neutral area, and then I’ll bring them both home,” says Patricia. 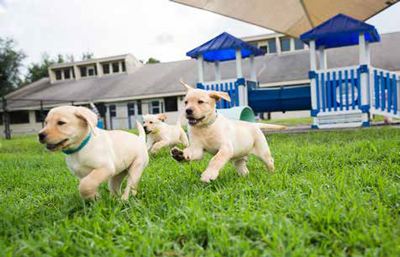 Southeastern Guide Dogs is an impressive organization with an impressive campus. The nonprofit organization is located just south of the Sunshine Skyway Bridge, off US 41 in Palmetto. As I turned into the sprawling 33-acre campus and drove through the main gates, I felt as if I were visiting a small junior college, which in some respects I guess I was. There were about a half-dozen modern one-story buildings with names like Puppy Academy, Canine University Training Center, and the Canine University Residence Halls. Training dogs for a career helping people is serious business. It requires two years of education and training with highly skilled staff and hundreds of volunteers. 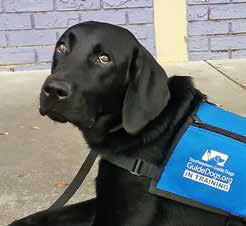 Since 1982, Southeastern Guide Dogs has trained more than 3,000 dogs and given them at no charge to recipients throughout the US. At first, the focus was on training guide dogs for people with visual impairment, but in 2006, that mission was expanded to include military veterans with a variety of disabilities, from vision and hearing loss to seizures and PTSD. Military Gold Star families can also receive a dog for emotional support. According to Ruth Lando, manager of public relations, Southeastern Guide Dogs receives no government funding and instead relies on donations, sponsorships, and other ways to give, including local walkathons. The St. Petersburg Walkathon February 23 at Vinoy Park was part of a regional effort to surpass the world record for greatest number of dogs wearing a bandana at a single event. 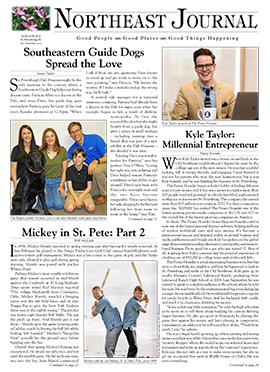 The SEGD website www.guidedogs.org reports that the guide dog program started as a small training kennel in the 1980s in Apollo Beach, the brainchild of Lions Club member Robert Miller and his wife. A few years later, Dr. Harris Silverman took over and moved the program to Palmetto, where it is located today. But the campus I saw was vastly different from the early days. In the last few years, a $30 million capital campaign has transformed the campus to include state-of-the-art training facilities, ‘residence halls’ for the dogs, an outdoor gym, and water splash park so the dogs learn to be comfortable around water. There’s even a ‘student center’ for recipients, who live on campus for several weeks as they learn how to work with their dog. Everything that could be possibly needed is here. A canine rehabilitation program makes sure the dogs are in top physical condition. Behavior assessment specialists evaluate the dogs to determine which future career path would best match their personality and skills. Veterinarians manage their health. There are even genetic specialists to make sure that the female dogs chosen for the SEGD breeding program are the best qualified to birth the next generation. All of the dogs bred in the program are either Labradors, Golden Retrievers, or Goldadores (a combination Lab and Golden). The whelping and neonatal area rivals some hospitals for the care of pregnant dogs and newborn puppies. I had the opportunity to peek inside some of the buildings. My first stop was at Puppy Academy, where I fell in love with the adorable six-to-seven-week-old furry puppies. I had to put on booties before I entered the area to avoid spreading germs to these little future ‘super-heroes.’ As I sat on the floor, a little chocolate Lab came wiggling over, ready to play. The puppies didn’t have names yet, but instead wore a color-coded collar based on their birth order. I loved hearing that the staff doesn’t choose the dogs’ names. Instead, that honor goes to donors who contribute $5,000 to sponsor a dog. As you can imagine, the names chosen for the dogs run the gamut from traditional to unique. The naming ceremony takes place when the dog is several months old and ready to live with a puppy-raiser family. Kristen and Mitchell Rogers, whose family owns Rogers Dry Cleaners on 4th Street North, have been volunteer SEGD puppy raisers for several years. 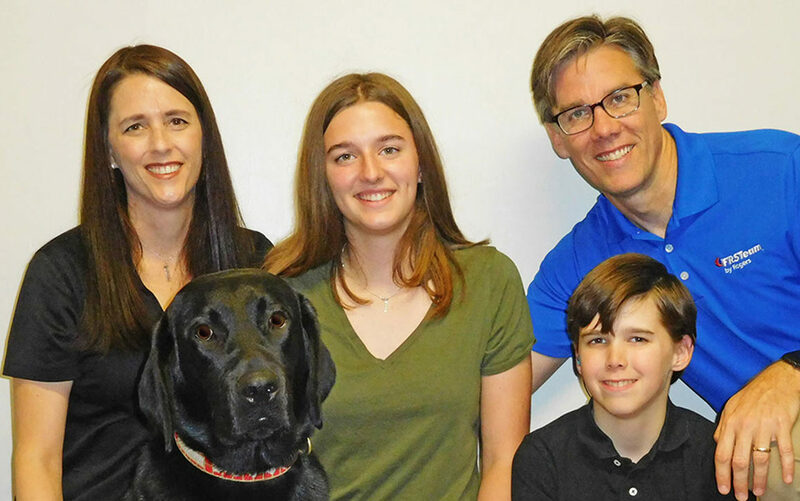 The Rogers and their children Ali (19), Zoe (15), and Cole (10) have raised four guide dogs: Flo, Hawkeye, Wrigley, and their current dog, Harris, a lovable one-year-old black Lab. Harris goes to work with Kristen at her office at FRSTeam by Rogers (Fabric Restoration Service Team). Kristen is now a volunteer area coordinator for SEGD, which means she helps organize twice-monthly meetings for puppy-raiser families. She also oversees a six-week behavior-and-obedience training class. “There are a lot of expectations for the dogs. There are rules about toys, collars, food, housebreaking, and grooming. The dogs have to learn 20 commands. It takes a lot of time and patience and repetition,” says Kristen. As Mitchell points out, “Your job is to deliver a well-adjusted, well-mannered dog that can walk nicely on a leash.” No easy task! Harris will return to the SEGD campus for ‘college’ when he’s about a year-and-a-half old. That’s when he’ll begin the formal training program for either a guide dog or therapy dog. I told Kristen that I could not imagine the heartbreak of having to give up a puppy that had been part of your day-to-day life for more than a year.